The Picasso being offered for sale at Ralph Sipper's booth (#304) during the 52nd California International Antiquarian Book Fair next week may be one of the more reasonably priced pieces to hit the market in recent years. It's an original six-color crayon drawing by Pablo Picasso being offered for $40,000. But the provenance is priceless. The image of a grinning lion, rendered in Picasso's inimitable style, graces the back of an oversize postcard measuring 4.75" by 6.5." 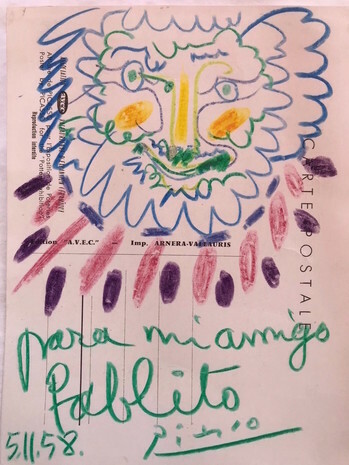 Sent from Cannes, France, Picasso mailed the card to Connecticut, where Pablo Frasconi, the six-year-old son of woodcut artist and book illustrator Antonio Frasconi, was the intended recipient. 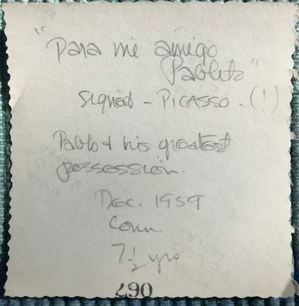 Signed simply, "Para mi Amigo, Pablito 5/11/58, Picasso," the card was a thank you note for a gift of the boy's own sketchings sent to the famous artist earlier that year. "Unfortunately, the detail of what we sent Picasso was not recorded as far as I know," said Frasconi. "I know it included Antonio's artwork too, and a letter to Pablo." In adulthood, Frasconi followed in his father's creative footsteps, taking up the video camera rather than the engraver's burin. "As a young man, I remember seeing the film of Picasso painting on glass, and reading the David Douglas Duncan book Picasso's Picassos," explained Frasconi. "All of this resonated when I watched the films of [non-narrative filmmaker] Stan Brakhage at MOMA in 1971. I immediately decided to study film with him. Brakhage had that same innocent and introspective eye that I detected and admired in Picasso, and, at times, emulate in my own work." Indeed, as an 18-time grant recipient from the National Endowment for the Arts, the National Endowment for the Humanities, and the American Film Institute, many of Frasconi's films have focused on the lives of artists, starting with his own father. Other notable films include "The Light at Walden," and "The Survival of a Small City." He is currently a professor at the University of Southern California. Images, from top: Pablo Picasso postcard, used with permission from Ralph Sipper Books. 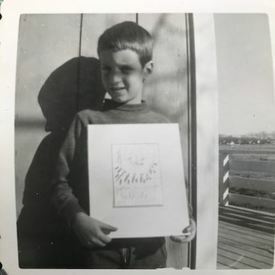 Photograph, front and verso: "Pablo and his greatest possession," taken December 1959 by Leona Pierce. Used with permission from Pablo Frasconi.